It is an honor to formally recognize the extraordinary achievements of those selected for the 2013 National Roadway Safety Awards. The individuals, groups, and agencies participating in this program have shown a strong commitment to eliminate deaths and serious injuries on the Nation's roadways. 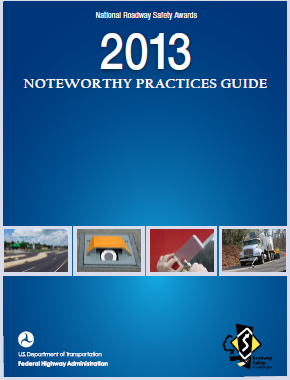 This guidebook showcases each of the 2013 National Roadway Safety Award winners. This year's honorees have implemented ground-breaking techniques to significantly reduce crashes on our Nation's roadways. We carefully evaluated each entry for innovation, effectiveness, and efficient use of available resources. Through infrastructure and operational improvements, State and local entities have enhanced intersection safety, decreased roadway departures, and used low-cost solutions to improve rural safety. Award winners also used lifesaving techniques in the categories of program planning, development, and evaluation. For more than a decade, the Federal Highway Administration and the Roadway Safety Foundation have partnered to sponsor this national awards program. Our ongoing partnership will continue to create innovative and life-saving measures and make our Nation's roadways safer. This program provides the opportunity to recognize and share innovative practices in roadway safety. Congratulations to all of the 2013 National Roadway Safety Awards winners. THE SAFETY CONCERN High rates of statewide intersection-related crashes. THE SOLUTION Systematic application of J-Turn Intersections to restrict access and minimize points of conflict. THE RESULT Reductions in the number of crashes, injuries, and fatalities at treated intersections. Intersection-related crashes account for approximately 15 percent of Tennessee's roadway fatalities. Improving intersection safety has become a major focus of roadway safety programs in the State– one of the eight emphasis areas addressed in the Tennessee Strategic Highway Safety Plan (SHSP) and in the development of the Tennessee Intersection Safety Action Plan in 2007. As a result, the Tennessee Department of Transportation (TDOT) has implemented more of the intersection safety projects through the Highway Safety Improvement Program. 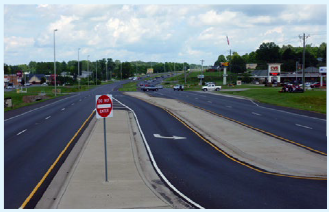 Tennessee's Intersection Safety Action Plan includes systemic improvements (such as advanced warning signs and striping) at both signalized and non-signalized intersections that have resulted in reduced fatalities and serious injuries. As part of its safety efforts, TDOT began experimenting with the use of J-Turn Intersections in 2007. A J-Turn is an alternative intersection design and a corridor management method used at intersections to restrict access. The configuration prevents direct crossing and left turns from the side roads, reducing the number of intersection conflict points from 42 to 24 and right angle conflict points from 24 to 4. Working with regional traffic engineers, TDOT selected four intersections with numerous sideswipe crashes to implement J-Turn improvements. For the 2 years prior to implementation of the J-Turn treatments, there were a total of 54 crashes at these locations with 2 fatalities and 8 incapacitating injuries. Because the installations were staggered, post-installation results vary from site to site, but for all sites treated to date, there have been only 10 crashes with no fatalities and no incapacitating injuries. Restricting the direct crossing movement reduces the number of conflict points and severity of crashes. An off-set left turn lane provides additional site distance and decreases the number of sideswipe-type crashes. THE SAFETY CONCERN High rates of roadway departure crashes on rural roads. THE SOLUTION High friction surfacing treatment on selected horizontal curves. Kentucky's rural, often mountainous terrain can present a challenge to many drivers, and the Kentucky Transportation Cabinet (KYTC) recognized that it needed to apply improved safety treatments on horizontal curves throughout the State to reduce the number of roadway departure crashes experienced statewide. As a result, KYTC reviewed a variety of low-cost safety options for reducing roadway departure crashes in both wet and dry weather conditions. After thorough consideration, the KYTC conducted an initial pilot program with a high friction surfacing treatment (HFST), a compound comprising a two-part, highly modified epoxy resin binder and a specially graded, high-friction bauxite aggregate. Under this pilot program, Interstate Road Management, Inc. applied the HFST at 26 locations statewide. After implementation, KYTC measured the friction numbers and found that they had increased dramatically. With the increase in friction came a reduction in skid-related roadway departure crashes and fatalities on treated roadways, a nearly 69 percent decrease. As a result, KYTC launched a three-year statewide HFST program at over 75 locations in 2010 to improve pavement friction and reduce roadway departure crashes on horizontal curves. HFST was applied at specific sites where skidding crashes resulted in fatalities, serious injuries, and property damage. Each site was linked to crash data collected and plotted by KYTC to ensure appropriate placement of the HFST installation. A simple before/after comparison shows that when compared with previous 3-year crash data, wet-weather roadway departure crashes dropped from 357 to 33 at sites where HFST has been applied. Similarly, dry-weather roadway departure crashes have also seen a sharp decline, from 126 to 28. 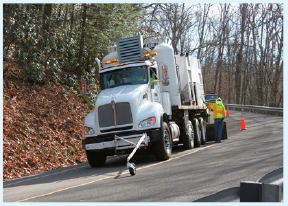 DBI's (IRM) Road Management Unit utilizes the industry's only fully automated HFST application vehicles, which can apply HFST continuously at full lane width. THE SAFETY CONCERN High levels of run-off-the-road crashes on specific rural roadways. THE SOLUTION The systematic application of raised pavement markers. THE RESULT Measured crash reductions – and an associated reduction in injuries and fatalities – on treated segments. With help from the FHWA and Alabama Department of Transportation (ALDOT), Mobile County, Alabama determined that 10 rural roadways within the county rated the highest in the State for run-off-the-road crashes. These roadways, totaling more than 68 miles, had experienced 224 run-off-the-road type crashes between 2005–2008, resulting in 7 fatalities and 152 injuries. The challenge was to determine the most effective low-cost treatment. While rumble strips can reduce run-off-the-road crashes, installing them requires large machinery, manpower with technical skills, and oftentimes additional right of way, making them a cost-prohibitive solution. 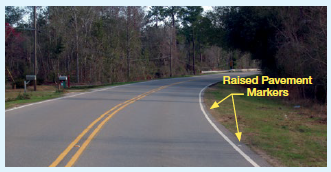 To counter these cost concerns, Mobile County and ALDOT implemented a program for the systematic application of raised pavement markers (RPM) to improve sight distance recognition and guidance along the edge of the pavement, especially during wet weather conditions at night. One-directional, white RPMs adjacent to the white edge-line stripe were easily installed using existing traffic maintenance department equipment and manpower. The program set guidelines for consistent implementation for all roadways within the county. RPMs were placed just outside the existing edge-line stripe. Tangent sections of roadways would have RPMs installed at 80 feet spacing. at the approach to a curve having an advance warning curve sign, the spacing would be 40 feet apart from sign location to the beginning of the curve. In the curve, the spacing would be 20 feet until reaching the tangent section. Based on 2009–2012 crash data, crashes on the initial 10 roadways treated dropped from 224 to 33, from 7 fatalities to 0, and from 152 injuries to 10. The average number of crashes for all 10 roadways decreased by 85.3 percent. 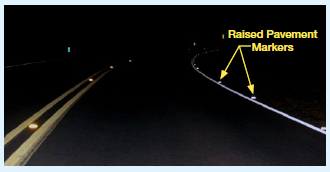 RPMs give critical guidance to drivers, especially along dark and rainy county roadways. As a result of this pilot project, they are now included in most roadway projects in Alabama. Example of 20 feet RPM spacing for a curve. Example of same location at night. THE SAFETY CONCERN Not enough equipment to inspect the retroreflectivity of all signing in the region. THE SOLUTION An inexpensive sign inspection kit and a sharing agreement for costly inspection equipment. THE RESULT Reductions in overtime costs for nighttime inspections, reductions in the number of signs that need to be replaced annually, and an easily compiled, inexpensive ($50) portable field kit that is available at all times. In the summer of 2011, the Cornell University Local Roads Program (CLRP) initiated a project with three County Highway Departments in western New York to create a sharing agreement so that each agency had access to a retroreflectometer for inspecting local signing in support of the new Manual on Uniform Traffic Control Devices (MUTCD) sign retroreflectivity standards. This sharing program included all three counties as well as local jurisdictions in the respective counties (i.e., towns, villages, and one city). 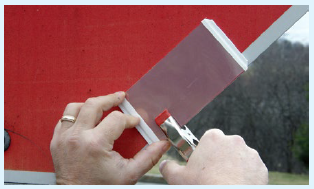 In addition to the retroreflectometer sharing agreement, CLRP developed a total of 50 inexpensive sign inspection kits, costing less than $50 each. The kits use clear "overhead projector" sheets in layers to degrade the retroreflectivity of small comparison panels of different colors to a conservative level above the minimum retroreflective levels identified in Table 2A-3 of the MUTCD. The clear overhead sheets are the same ones used with overhead projectors and are available at office supply stores. The inspection kits allow local highway agencies to quickly and accurately perform nighttime inspections, virtually eliminating "guessing" about the quality of a particular sign. 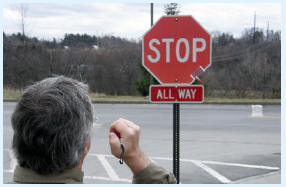 For example, prior to receiving the kits, sign technicians in Wyoming County, New York would err on the side of caution and replace many signs that were actually adequate. With the kits, they replaced 20 percent fewer signs than they had replaced previously due to concerns about retroreflectivity. In addition, they saved a day of overtime, inspecting all the county's signs in only 3 nights. Savings from the reduction of 2 full shifts of overtime work and approximately 30 signs amounts to $3,000 each year. Attaching inspection panel to target sign. (done at night during actual use). Contact: David P. Orr, Ph.D. THE SAFETY CONCERN Geometry of existing rotary allowed higher speeds and conflicts between entering and circulating traffic and could not support vehicles with a larger turning radius. THE SOLUTION Converting the existing rotary facility to a modern roundabout. THE RESULT Measurable reductions in crashes, injuries, and fatalities. Encouraged by an Insurance Institute for Highway Safety study on the extensive safety benefits of converting signalized and all-way stop-controlled intersections to modern roundabouts, the Connecticut Department of Transportation (ConnDOT) decided to convert some of its old traffic circles to roundabouts. ConnDOT reviewed several sites and selected three pilot locations based on crash history, volumes, constructability, and the potential for improvement. 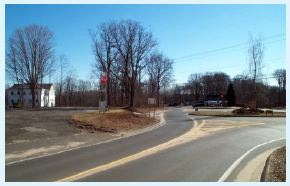 ConnDOT chose the intersection of Routes 80 and 81 in the town of Killingworth as its first location. The most obvious deficiency at this intersection was the lack of deflection on the entrances. As with most rotaries, this one was originally configured to give the right of way to the entering traffic, with traffic in the circle having to yield to incoming vehicles. The entrances had little if any deflection, which allowed for high entry speeds and increased the potential for a serious collision. To slow traffic on the approaches, ConnDOT created some deflection and added a truck apron around the central island. The overall dimensions of the intersection were not altered, but the east leg was realigned slightly to improve the angle of the intersection. 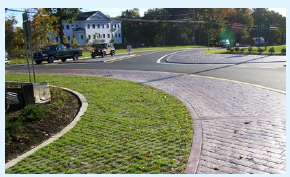 In addition, ConnDOT installed raised splitter islands and raised truck "blisters" (raised truck aprons placed on the outside of the roundabout) on two of the four quadrants. ConnDOT removed some of the existing pavement to create a more circular intersection shape, which helped with deflection and slowed traffic. Speeds are now within the range of 15-20 MPH for all movements, eliminating the significant speed differentials that existed previously. Comparing the latest available 3-year period (2009–2011) crash history to the 2005–2007 data, the total number of crashes was reduced from 20 to 10 (50% reduction), the number of injury crashes was reduced from 6 to 1 (83% reduction), and the number of injuries was reduced from 7 to 1 (86% reduction). Before: Rotary prior to conversion. Note lack of deflection from entrance on far side of the photo. After: Close-up of truck apron constructed during conversion to roundabout along with a raised truck "blister" on the outside of the roundabout. THE SAFETY CONCERN Limited ability to measure the effectiveness of winter weather treatments and their impact on driver safety and mobility. THE SOLUTION A new performance measurement system that provides a fact-based situational assessment to support optimal decision making. THE RESULT A measurable reduction in ice duration on highways and winter slide-offs—a leading cause of highway fatalities in the region where the WPM is used. 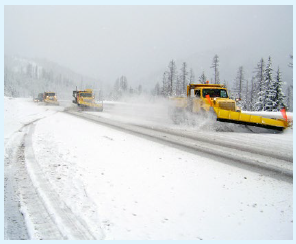 The Idaho Transportation Department (ITD) has spent many years developing a progressive winter maintenance program that invests in a number of areas such as labor, training, equipment, and materials. Until recently, however, the ITD had difficulty assessing how well its winter maintenance budget was being allocated and how its winter maintenance activities were affecting mobility and safety on Idaho's highways. In response, ITD worked with Vaisala, a global leader in environmental and industrial measurement, to develop a Winter Performance Measure (WPM) system. This first-of-its-kind system consists of three indices that provide a quantifiable method of determining the effectiveness of winter maintenance activities. The WPM system polls Idaho's road weather information system (RWIS) stations every 15 minutes and uses the data to plot and track trends in ice and snow accumulation or removal, air and pavement temperature changes, and surface friction (grip) (using a safe driving friction coefficient benchmark of 0.60.). The WPM's algorithms calculate storm severity based on precipitation amounts, wind velocity, and surface temperature. Based on the WPM's storm severity assessment, ITD's maintenance crews can make decisions about road-treatment options, application rates, and treatment timing as well as help them identify the locations where treatment is most needed. Providing RWIS data in real-time removes the need for most subjective assessments and promotes decisions that are consistent and measurable. After storms have passed, ITD uses the winter-performance index (normalized by storm severity) and the winter mobility index to measure the effectiveness of its treatments and the impact of those treatments on driver safety and mobility. ITD has made major improvements to winter safety and mobility by reducing ice duration on Idaho highways by approximately 75 percent. The WPM system has helped ITD reduce roadway departures that occur specifically because of icy road conditions—a leading cause of highway fatalities in Idaho—by more than 40 percent in southeast Idaho, where WPM was first implemented. Snow plows at summit on I-90 in District 1. THE SAFETY CONCERN A high number of fatal and injury accidents involving commercial vehicles on Washington State roadways. THE SOLUTION Modified commercial off-the-shelf technology with sophisticated automation and analysis software capable of identifying commercial vehicle brakes and carrying out a complex safety analysis in milliseconds. THE RESULT Significant numbers of citable violations were accurately identified, as validated by tests. The Washington State Patrol (WSP) and the Washington State Department of Transportation (WSDOT) felt something new was needed to help decrease the number of fatal and injury accidents involving commercial vehicles on Washington State roadways. While there is no single remedy, WSDOT and WSP targeted vehicle brake failure as a significant contributing factor that needed to be addressed. Together, the agencies created a project team that enhanced a commercial off-the-shelf technology to create an automated brake inspection tool: the Automated Infrared Camera System (AIRS). 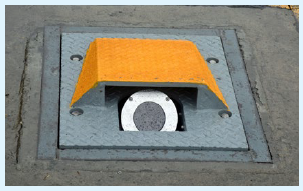 The system is designed to inspect each commercial vehicle's brake system as it enters an AIRS-equipped weigh station. It performs its inspection at ordinary travel speeds, without interfering with the vehicle and without the operator's awareness. AIRS uses a single Forward-Looking Infrared Radar (FLIR) thermal imaging camera with a wide-angle lens buried in the center of the roadway to view each vehicle's undercarriage and identify its brakes. Using advanced automation and analysis software, AIRS carries out its complex analysis in milliseconds. A color camera mounted on the roadside and integrated into the AIRS system provides a vivid color image with each vehicle record to support visual identification. The core AIRS development team used several innovative approaches to complete the project, including a "virtual project team" method to access vendor expert knowledge and insight at no additional cost. The team also borrowed equipment from manufacturers to demonstrate its capabilities. Once the equipment was proven effective and showed that it met the needs of the program, it was purchased. The team also gathered information about user needs from on-site weigh station enforcement officers. For example, users who had experience with infrared systems found it challenging to watch and analyze the indistinct images, and it took a great deal of time to learn what to look for. In response, the team designed AIRS with a simple, straightforward view screen on which potential faults are shaded in red and easily identified. View of camera when placed in roadway. This unorthodox location exposes a perfect view of each brake as the vehicle passes over the camera. THE SAFETY CONCERN Maximizing the impact of safety investments to get the most "bang for the buck." THE SOLUTION Reevaluating the way safety projects are assessed and ranked to improve both cost effectiveness and overall safety results. THE RESULT A list of ranked safety improvement projects reflecting the most effective use of funding for safety projects. 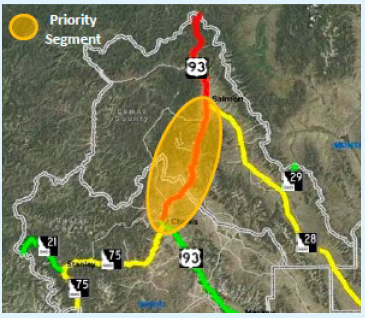 In an effort to improve its cost effectiveness in funding safety projects, the Idaho Transportation Department (ITD) undertook an innovative, data-driven program for safety analysis on roadways throughout the State—an effort encompassing 5,000 miles of roadway across six districts. Building on a pilot effort to examine rural road safety, this program applied a new evaluation method and helped identify the highest priority locations for safety improvements. This project comprised four parts: 1) assessing 5 years of statewide crash records to determine potential priority locations for safety improvements; 2) diagnosing the priority locations to determine causal relationships between a site's physical characteristics and crash records; 3) identifying recommended safety improvements for each location's diagnosis to generate the greatest reduction in fatality and crash rates; and 4) conducting a benefit-cost analysis to rank the recommended safety improvements and determine how best to invest a limited amount of funding. To maximize the benefit from a limited pool of funding, ITD ranked each safety improvement project on the expected benefit in fatality and crash reductions offset by an annualized cost of the project. Based on historical data, ITD determined the expected benefit by applying an average cost to each level of crash severity combined with the expected reduction in fatality and crash rates associated with a given safety improvement project. The recently developed Highway Safety Manual provided the basic methodology for estimating the potential annual reductions in the number and severity of crashes for segments and for intersections on the State highway system where higher-than-average crash rates have been reported. The expected reduction is based on the improvement as well as the existing roadway characteristics and crash history. The resulting list of ranked safety improvement projects provides ITD with a recommendation for how best to distribute funding for projects. Priority corridor identified by the data. THE SAFETY CONCERN Not enough attention to local and regional high-crash locations. THE SOLUTION A proactive approach to working with local road owners and stakeholders to understand perceived risk, conduct crash data analysis, and provide engineering support to remediate high-crash locations. THE RESULT An increased focus on intersection and pedestrian safety resulting in tailored solutions to each problem area. New Jersey's Road Safety Audit (RSA) program uses coordination and collaboration to address traffic deaths and serious injuries at local and regional high-crash locations. Working with three of the State's metropolitan planning organizations (MPO)—North Jersey Transportation Planning Authority (NJTPA), the Delaware Valley Regional Planning Commission (DVRPC), and the South Jersey Transportation Planning Organization (SJTPO)—as well as county and local agencies, engineers at Rutgers' Center for Advanced Infrastructure and Transportation (CAIT) Transportation Safety Resource Center (TSRC) conducted focused screenings to identify regional high-crash locations. These screenings form the basis for communication with road owners of these highly ranked crash sites. The road owners provide "local knowledge" that , combined with the engineering guidance available from TSRC, yields a proactive approach based on perceived risk as opposed to crash history alone. The program aims to reduce traffic deaths and serious injuries by performing RSAs with multidisciplinary teams who make recommendations for short- and long-term countermeasures that can significantly improve safety. For these selected sites, CAIT engineers use Plan4Safety to conduct a crash analysis. 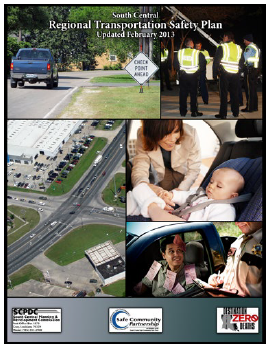 Plan4Safety is a web-based, comprehensive crash analysis and decision support software application. It compiles every single crash record in the State from the past decade and allows users to filter through over 1 million crash records in seconds—rather than weeks—based on user-defined parameters. Using Plan4Safety, CAIT analysts run crash data for selected roadways and identify causal factors that provide engineering guidance to direct the focus of the site visit . For example, if engineers find that a roadway experiences many nighttime crashes, the field review teams may pay particular attention to lighting or sign retroreflectivity during the site visit and focus on opportunities to support engineering solutions for that particular concern. To date, CAIT has conducted 11 RSAs in New Jersey, including in urban areas where all road users can be affected by safety issues. 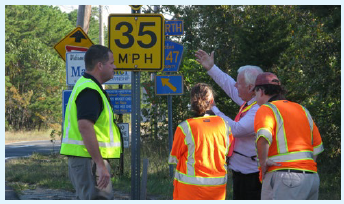 CAIT's RSA team examines sign visibility on a county road in southern New Jersey. THE SAFETY CONCERN Need to reduce fatalities and injuries related to alcohol-related driving, occupant protection, young drivers, and infrastructure and operations. THE SOLUTION A partnership that uses a data-driven action plan to identify regional and local projects that will address four safety emphasis areas. THE RESULT Measured reductions in alcohol-related serious injuries as well as in serious injuries resulting from lack of seatbelt use. The South Central Regional Transportation Safety Plan (SCRTSP) is the first regional, data-driven action plan developed in Louisiana as part of the State's efforts to implement its Strategic Highway Safety Plan (SHSP). It is a living document that adopts and disseminates the SHSP "Destination Zero Deaths" goals and strategies down to the regional and local levels. The SCRTSP is the product of the South Central Safe Community Partnership (SCSCP), a 13-year partnership among Federal, State and local agencies from six parishes in the region—including the South Central Planning & Development Commission (SCPDC), the Louisiana Department of Transportation and Development (LADOTD), and the Houma-Thibodaux Metropolitan Planning Organization (HTMPO). With ongoing support from these stakeholders, the SCRTSP uses action plans to undertake regional and local projects addressing four emphasis areas—occupant protection, alcohol-related driving, crashes involving young drivers, and infrastructure. The strategic process involves stakeholders at every level of government and includes appropriate representation for addressing the 4 E's of safety—engineering, enforcement, education, and emergency response. Implementation is ongoing; emphasis area teams meet regularly to develop, implement, and monitor SHSP strategies. As a result of the SCRTSP, stakeholders have greater guidance for implementing data-driven and low-cost safety engineering projects to reduce crashes. Innovative SCRTSP programs include using Road Safety Assessments, Breath Alcohol Testing (Bat ) Mobile Units at saturation patrols and sobriety checkpoints, expanding teen driver education efforts (e.g., drunk, unbelted, and distracted driving), and conducting the biannual Regional Impaired Driving Workshop and Advanced Roadside Impairment Driving Enforcement (ARIDE) Training for law enforcement officers. Safety grant funds from FHWA, the Louisiana Highway Safety Commission, and the Louisiana Department of Transportation and Development (LADOTD) pay for these programs. Volunteer hours of service from partner agencies also are used. As of August 2013, 70 percent of the plan has been implemented. With the assistance of Louisiana State University, LADOTD, and contractor partners, the coalition has determined that there has been a decline in the South Central Region's 3-year-average of fatalities and serious injuries where lack of seatbelt use or driving under the influence of alcohol are causal factors. SCRTSP's combined 4E approach is slowly paying off; ongoing implementation will help the region achieve its goal of a 50 percent fatality reduction by 2030. THE SAFETY CONCERN Road safety data alone may not adequately support comprehensive analyses of road safety; physical infrastructure elements may also play a role at high-crash locations. THE SOLUTION Assessing and benchmarking the relative safety of roads using historical crash data and roadway inventory data. THE RESULT The plan was completed in early 2013 and is now proceeding to the programming and implementation stage. 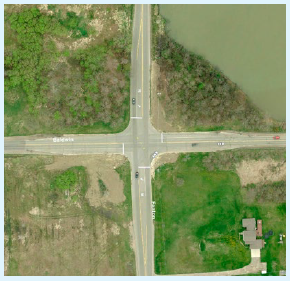 In 2012, the Genesee County Road Commission (GCRC) in Flint, Michigan, signed an agreement for a U.S. Road Assessment Program (usRAP) Safety Improvement evaluation of the county road system. Initiated in 2004 as a pilot by the AAA Foundation, the usRAP program was designed to assess and benchmark the relative safety of roads using historical crash data and roadway inventory data. The program includes a Road Protection Score (RPS), which can identify road segments with higher crash potential through analyses of road inventory data relative to design features that are strongly correlated with the risk of serious crashes. 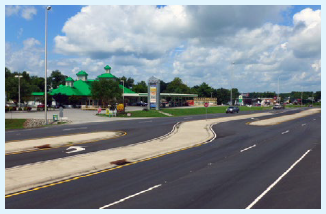 Most importantly, the RPS produces a "safety investment plan" that provides cost-effective road safety improvement options for road authorities to consider in order to lower the risks identified. GCRC developed the safety improvement plan based on a comprehensive review of the existing physical infrastructure of the county road system. Project staff obtained and assembled data on over 40 existing safety-related infrastructure elements for more than 8,600 300-ft roadway segments. The project database was uploaded to the usRAP Tools software and processed to develop a safety improvement plan. The software evaluated nearly 70 crash countermeasures for each 300-ft roadway segment, identified those countermeasures that made engineering sense for the location, and then selected the most cost-effective countermeasures for inclusion in the plan. Elements of the plan include shoulder paving, pedestrian crossings, sidewalk provision, delineation improvements, lane widening, intersection signalization, left-turn lane provision, roadside barriers, road surface improvements, and rail crossing upgrades. The development of the plan was completed in early 2013 and is now proceeding to the programming and implementation stage. Fenton Road at Baldwin Road. Contact: John H. Daly III, Ph.D. THE SAFETY CONCERN Parents want to play an effective role in teaching young drivers about best practices and driving laws, but do not always know how. 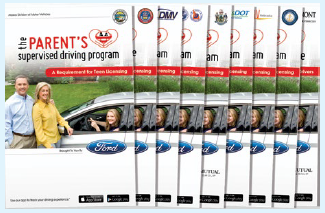 THE SOLUTION Instructions for parents on how and what to teach their teen during the supervised driving process, including practicing in a variety of conditions and focusing on "higher order" driving skills. THE RESULT Improved support and education for the parents of student drivers. Research has shown that when parents are actively engaged in the supervised driving process teens are 50 percent less likely to crash, 71 percent less likely to drive intoxicated, 30 percent less likely to drive distracted, and twice as likely to wear seatbelts (Children's Hospital of Philadelphia Research Institute and State Farm Insurance, Driving Through the Eyes of Teens: A Closer Look, February 2012. Available at : http://teendriving.statefarm.com/research-stats/driving-through-the-eyes-of-teens-a-closer-look (accessed August 12, 2013)). Despite the best intentions of State agencies and safety organizations, however, very few parents have a clear understanding of the teen driving laws and behind-the-wheel best practices that will help their teens become safe, smart drivers. This is due, in part, to the general lack of readily available resources for parents of teen drivers. The Safe Roads Alliance worked with State department of motor vehicles (DMV) staff from around the country, highway safety researchers, academics, behavioral scientists, educators and parents and teens to develop the "best-practices" based Parent's Supervised Driving Program (PSDP). PSDP reaches out to parents of teen drivers at a critical time in the teen learning process. Currently available in 13 States, PSDP is provided to DMVs at no cost in an effort to make the most of the supervised driving period that is generally required as part of graduated driver licensing (GDL). The program includes step-by-step instructions for parents on how and what to teach their teen during the supervised driving process, including practicing in a variety of conditions and focusing on "higher order" driving skills. The program not only strengthens the supervised driving period, but also pushes parents to extend their involvement beyond the requisite 30–70 hours of supervised driving time. The program now also includes a mobile app, RoadReady, that helps track and log the time and conditions of teen driving experiences. 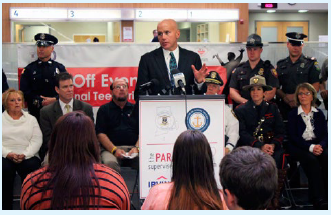 Press event at Rhode Island DMV HQ for 2012 National Teen Safe Driving Week. Program books from Alaska, Colorado, Delaware, Idaho, Maine, Massachusetts, Nebraska, Rhode Island, and Vermont.